There is good old cow’s milk, of course, and there is goat’s milk, which makes for delicious cheese. Then there are the vegan-friendly milks, like almond milk, coconut milk, or soy milk, sucked straight from the teat of... you know, I really don’t know and I don’t want to think about it. And I can sleep at night, knowing of the existence of these milks. I see these milks at the grocery store and while anything other than cow’s milk disgusts me personally, I salute them. Glass of milk with slab of meatloaf? Gross! But lately milk varieties have been, how shall we say this, wilding out. Suddenly there is donkey’s milk (which I thought was reserved not for drinking but for great Korean sheet masks) and horse milk. There’s hemp milk, which god knows how that is made, and oat milk. But now I learn that not only are people are out here drinking camel milk, they’re drinking PEA milk?! And we’re actually discussing the possibility of cockroach milk? And I won’t even get into grown men who drink human breast milk to get buff at the gym. I’ve had it up to here with the milks. Let me say that I would consider myself, in general, anti-milk. I agree wholeheartedly with Kara Brown’s iconic take that, yes, adults should not be drinking milk like large, gurgling babies. I didn’t grow up in a household where people drank large glasses of milk with every meal (*gag*) and I also suspect that through centuries of my Jewish ancestors keeping kosher, I’ve somehow genetically developed a distaste for pairing the beverage with anything other than other dairy-based desserts. Glass of milk with slab of meatloaf? Gross! But if I’m eating a stack of Oreos, or want a splash in my coffee, or helping to construct a new host for Westworld, I’ll throw in some classic cow’s milk. That’s my limit. So I’m coming to this conversation from a privileged anti-milk perspective, in that I don’t have any allergies or digestive issues related to good old-fashioned dairy. I also enjoy consuming animals and the products they make, so that’s not an issue for me. So I want to be respectful of the dietary needs and moral decisions of others and say that I don’t judge anyone for whom “alternamilks” as they’re called (great band name idea, by the way) are a serious necessity. I can not keep up with these milks. But seriously, I can not keep up with these milks. I am merely trying to convey my frustration with this vast and growing milk economy, particularly because it seems like its rise is in part because many of these milks are said to possess vague beautification and health properties. 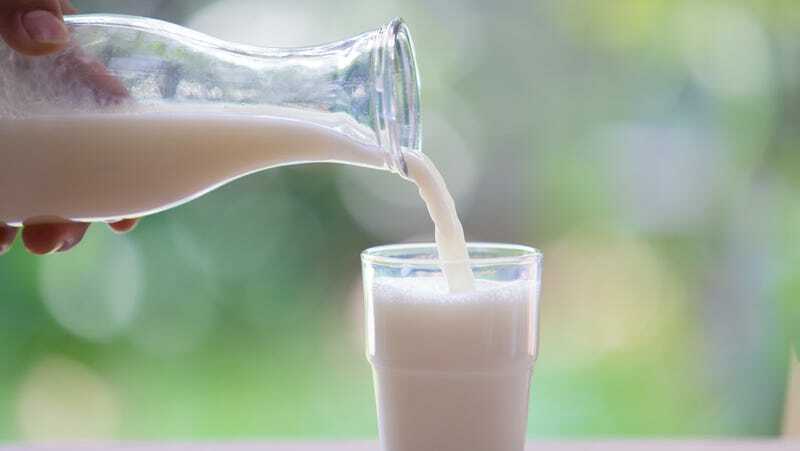 Horse milk is said to “strengthen the body and increases a person’s energy and vitality,” and donkey milk is said to be the “closest to human breast milk” which seems frankly unnecessary for adult drinkers. Hemp milk apparently increases your “mental capacity” and I have no idea what that means! The Goop-iness of it all is overwhelming. I’ll drink my cow’s milk and stay stupid, thank you very much. So, please, continue drinking your alt milks if you must. But if there’s a new variety, do NOT tell me what it is or what unconventional animal it’s coming from.